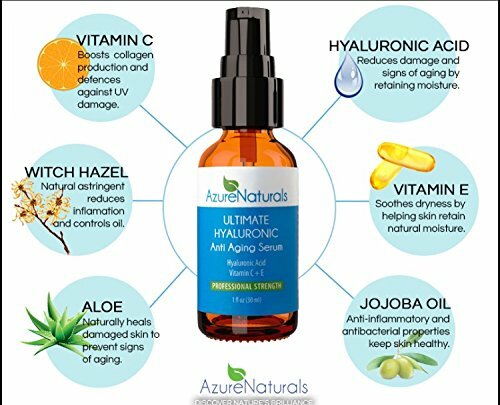 What does Azure Naturals Ultimate Hyaluronic Anti Aging Serum do? The Azure Naturals Ultimate Hyaluronic Acid Serum deeply hydrates the skin and the vitamin C and E help to fight the signs of aging, such as age spots, fine lines and wrinkles. The result is that your skin is softer, suppler and more youthful looking. The seller recommends that this product is used in conjunction with the Azure Naturals Ultimate Vitamin C, but both serums can be used alone. Softens and smoothes your skin. Reduces age spots and sun spots. 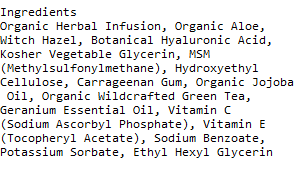 Who should use Azure Naturals Hyaluronic Serum? Anyone wanting to reduce the signs of aging, such as fine lines and wrinkles or to improve the tone and texture of the face will benefit from this serum. If you want to look younger and fresher and reduce age spots, then the Azure Naturals Ultimate Hyaluronic serum was designed to hydrate and plump up your skin and to give you a more youthful and suppler skin. How do you use the Azure Naturals Hyaluronic Anti Aging Serum? The Azure Naturals serum can be used morning and night on all skin types. First, cleanse your skin and pat dry, then apply a toner (only if you normally use one) and then apply a small amount of the serum to your face and neck area. Once dry, follow through with a moisturizer and makeup if desired. This serum is made in the USA and the ingredients are 98% natural and 72% Organic. Contains no parabens, alcohol or GMOs and is not tested on animals. Hyaluronic acid has been heralded as a fountain of youth, mainly due to its ability to retain more than 1000 times its weight in water. This capacity makes it a huge benefit in skin care anti-aging products that are designed to rapidly increase the moisture content of the skin. As we age our skin’s ability to retain moisture reduces and our skin becomes dry and more prone to fine lines. Hyaluronic acid helps our skin retain moisture and gives us a more plumped-up and fuller appearance. Vitamin C is a super antioxidant that is essential in wound healing, the production of new cells and in supporting our immune system. As an antioxidant, vitamin C also helps us fight the signs of aging by preventing and reversing the damage caused by free radicals. This means that fine lines and wrinkles are reduced and our skin has a healthier and more youthful glow. Vitamin E has long been used in moisturizing lotions and creams due to its ability to retain moisture and prevent moisture loss from our skin. It is also, along with vitamin C, a potent antioxidant helping to rejuvenate our skin and reverse the signs of aging. 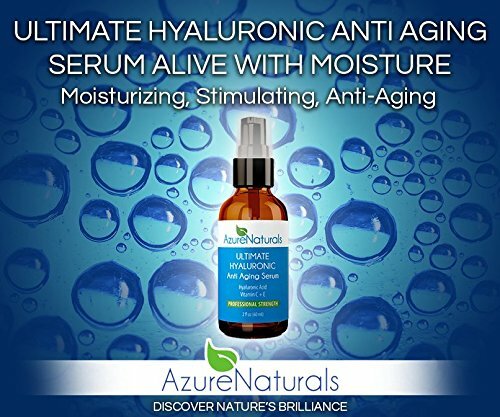 PROS: More than 90% of customer reviews gave the Azure Naturals hyaluronic acid serum a 4 or 5 star rating with everyone happy about its super hydration properties and antioxidant abilities. Women have found that their dry skin has disappeared, their fine lines have been reduced and their skin has a wonderful glow. It is also easily absorbed into the skin without leaving a greasy residue. Overall, customers feel that this is a good product that delivers what it claims to do in the ads. CONS: A few of the customer reviews gave this hyaluronic acid one star, mainly because they didn’t see any improvement in their skin after using this serum. This hyaluronic acid with vitamin C serum has more than a 90% positive rating from customers, comes in both 1 and 2 fl oz bottles, contains vegan hyaluronic acid and is not tested on animals. 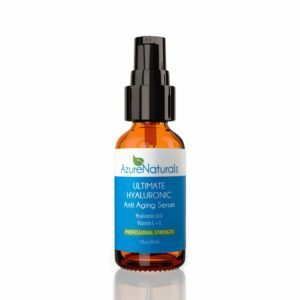 As far as this product is concerned, customers seem very happy with the results of using the Azure Naturals Ultimate Hyaluronic Serum, with the great majority seeing clear benefits and improvements in their skin. The seller offers a 365 day, 100% money back guarantee and will also refund shipping if you are not happy with this product.